So, you say you’re a bank? Drama. 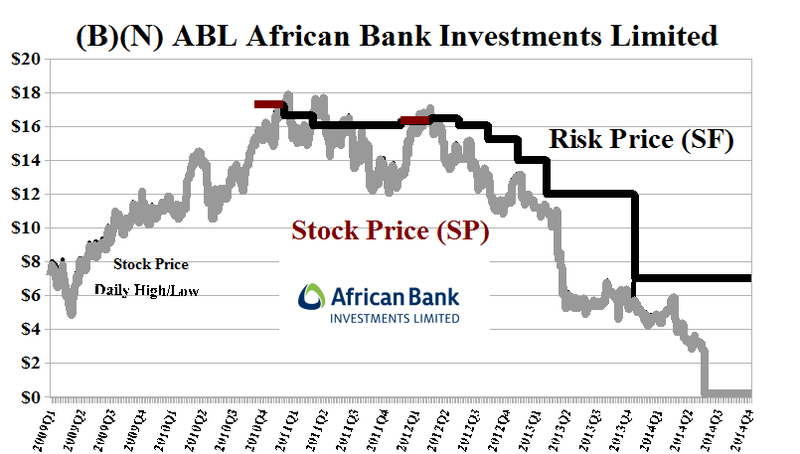 In its short life, African Bank Investments Limited, has never been a “bank”, although it seems to have been heading in that direction; please see Exhibit 1 below (Bloomberg, August 10, 2014, African Bank Splits to Isolate Loans During Rescue). Most of its funding is a long-term bond, but to be a bank, it needs customer deposits and, for those, it needs “deposit insurance” and, in this case, might consider offering their customers a higher rate of interest, something that they can’t get through their own endeavors; and it also needs to make profitable loans to customers and small businesses, and not tie-up its capital in “long term investments” – a furniture company? And unsecured and non-performing personal loans and credit cards. Where are the regulators when you need them, before the collapse? We don’t really need to bring out the “big guns” for this (please see our recent Posts, “(B)(N) The Canadian Bank Act” and “(P&I) The Banker’s Modality“) because the “Profit Box” increases only linearly if the modality is α>1.1, and that’s typical of “investment companies”. In this case, the modality was about α=1.5 in 2010, and has been worked down to the current α=1.17; please see Figure 1.1 on the left. 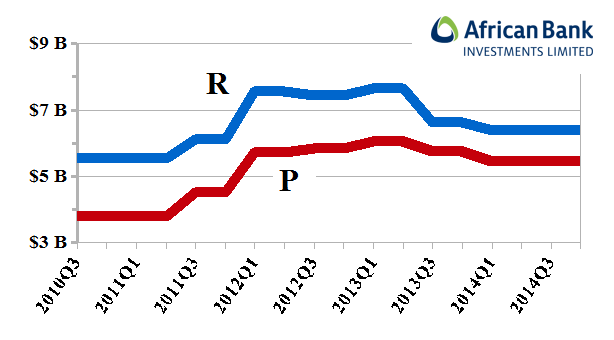 However, it’s because (R) “what is owed to the company” is converging towards (P) “what the company owes”, and that’s not because it’s becoming “more selective” about depositor accounts; please see Figure 1.2 on the left. Pity that investors who paid $14 for the stock just two years ago, and were maybe “harvesting” the dividend yield in excess of 5%, can only get $0.14 for it on Monday; please see Exhibit 2 below. African Bank Investments Limited is a bank. The two underlying operations of the company are unsecured credit and retail & furniture and appliances retailing environment. It operates through two primary businesses, African Bank and EHL. From the Company: African Bank Investments Limited, through its subsidiaries, underwrites unsecured credit risk through the provision of personal loans to the formally and informally employed residents. The company offers personal loans, overdrafts, credit cards, and vehicle finance. It also provides credit life policies to customers who utilize the loan and credit card products offered by African Bank, as well as funeral insurance products. The company is also engaged in the retail of furniture and appliances, and provision of related services under the Ellerines, Beares, Furniture City, Dial-a-Bed, Geen & Richards, and Wetherlys brands. It has operations in the Republic of South Africa, Zambia, Botswana, Lesotho, Namibia, and Swaziland. The company was formerly known as Theta Group Limited and changed its name to African Bank Investments Limited in 1999. 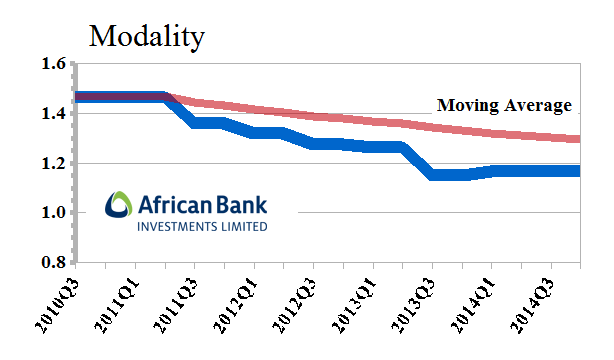 African Bank Investments Limited has 13,000 employees and is based in Midrand, South Africa. 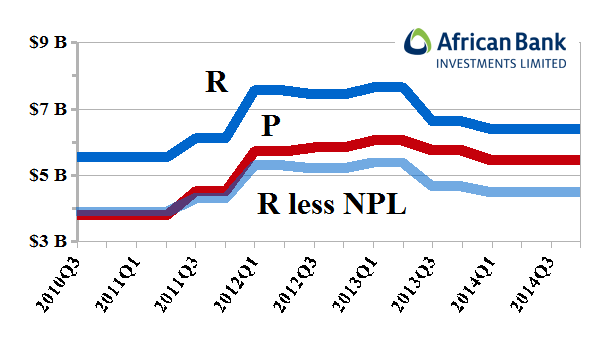 The bank has estimated that it’s non-performing loan portfolio (NPL) is 30% of its total assets. 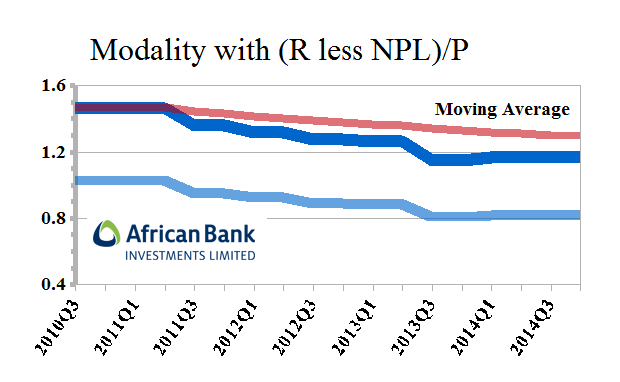 That’s an astonishing number but the bank attributes previous loan practices and the South African economy as the cause of its problem; please see Figure 3.1 and 3.2 on the left. It also creates a liquidity problem (payables) because the bank isn’t making any money on these loans, and a credit problem (receivables) because the money might not come back, and it has the same effect as “inventory on the shelf” which drives the “private modality” from α=1.17 (by the book) to α=0.8; please see our Post, “(P&I) The Banker’s Modality” for more information on what that does to profits. And for more information and additional guides to the theory, please see our Posts “(P&I) The Process – The 1st Real Dollar” which shows how a “currency” gets its value from the “subsistence economy” at the Company D modality, and “(P&I) The Process – The Guns of August” which explains how that modality actually “works”.